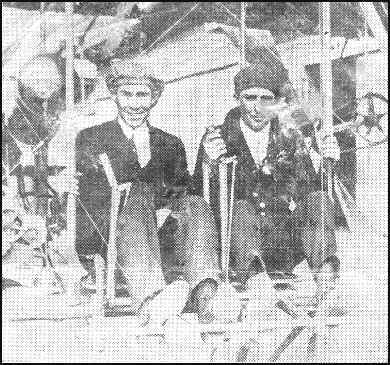 Edward Finan (left) and DeLloyd Thompson, Instructors at Cicero Field, during the Chicago Air Show of 1912 held on Chicago's lake front, at Cicero airdrome and Hawthorne Race Track. Their plane, a 1911 Model B Wright Bi-plane with dual controls, had a hickory frame and was covered with sail cloth over and under the wings. It was approximately 32 feet in length, 39 feet wide had a 30 horsepower motor, warped wings, no ailerons and two propellers. The motor had no carburetor. Finan, who now resides at Snug Harbor farm, Bristol, Wis., and Jesse C. Brabazon, 729 Central ave., Benoit, and Irving "Shake" Paradise, 6331 N. Glenwood ave., Chicago, who also were pioneer aviators, have formed the "Pioneers of the Skyways," which was organized for the purpose of "collecting, compiling and disseminating authentic information pertaining to the early pioneers of aviation, to the end that each will be fully credited for their deeds and accomplishments." They are now gathering material for a book about aviation and Cicero Field's contributions to it. Finan supplied The LIFE with the information for the series of articles on Cicero Field. ONLINE RESOURCES If you search for "DeLloyd Thompson", using the Google search engine, (6-30-07), you will find about 45 links. Among the most helpful is the following. Cicero Field Flight Instructors You can view a beautiful copy of the photograph at the top of this page on the website of the Wisconsin Historical Society. In addition, you will find some details of the occasion on which the photograph was taken. You can access the page by clicking on the title above. 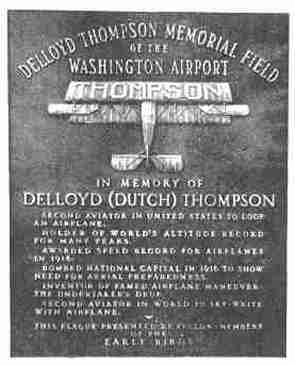 Any Early Bird who desires to contribute to the DeLloyd Thompson Memorial Fund to make up this difference is urged to send his contribution to the Fund care of The Reporter, Washington, Pa.
THOMPSON INSTRUCTS AT KINLOCH, 1912 Bad weather kept the Lillie school machines in the hangars the first part of the week, but on Thursday DeLloyd Thompson and Andrew Drew, instructors for the Max Lillie school, were up for four hours with the pupils here. Jesse Brabazon, Van Best, A. C. Carnes and Miss Uriel Johnstone are the pupils who are about ready for their licenses; James Colovas, F. A. Bergenthal, and Joseph Best need another week or so of training. Friday two hours of pupil training were sandwiched in between gusty weather. Thompson and Drew made half a dozen solos in the wind. It was planned to hold a meet on Saturday and Sunday, but as the two Lillie machines did not arrive on time, the meet was called off. Quite a crowd appeared at the field, however. Sunday afternoon and for their benefit, Lillie, Thompson and Drew went through some pretty maneuvres in gusty weather. Miss Katherine Stinson, who had been taught to fly by Max Lillie, and G Milton Vought, who had been scheduled to appear at the meet, were on the ground very impatient, because of the delayed arrival of the machines they were booked to fly. Vought is now a member of the Lillie organization. He superintends the condition of all the machines and holds the position of the firm's engineer. He also will do some flying at the winter camp in San Antonio. Carroll Gray's Lincoln Beachey website. Transcribed by Bob Davis - 9-8-03 "Kansas City, Aug. 6. - De Lloyd Thompson, of Chicago, in an American built aeroplane, broke the American altitude record today by rising to the height of 15,600 feet. The previous record was 11,260 feet, made by Lincoln Beachey at Chicago in 1913." DAVID LLOYD THOMPSON David Lloyd (shortened to De-Lloyd) "Dutch" Thompson died in his sleep January 28, 1949, aged 61, at his home in Washington, Pa., where he was born. He made his last flight at Meadowlands in 1937. In the early days of auto racing, Thompson was a crack driver. He then turned to Walter Brookins for instruction on a Wright airplane and soloed at St. Louis, August 6, 1910. A month or so later Brookins made the first flight for Washington, Pa.
Thompson continued flying as an instructor at Max Lillie's Chicago school and when he got around to it qualified for the ACA certificate #134, June 2, 1912; and expert #8 the same year. His first participation in contests was at the Chicago meet of Sept. 12-21, 1912, where he, Lillie, Gill, Wiggin, and Fish flew Wrights. In January of 1913 he began automobile-airplane track stunts at Indianapolis with driver Joe Briggs and in April, 1915, he and Oldfield joined forces for a 2-year tour of fair grounds. Time out for other flights, for he flew Chicago-Joliet in one hour on May 10, 1913. San Antonio saw its second over-city flight on January 5, 1913, when Dutch took off from Fort Sam Houston. On March 25, 1914, he made his first loop, at Griffith Park, Los Angeles, in a Day tractor with Gyro 80 engine, shortly after Beachey's first demonstration, Nov. 27, 1913. At Overland Park, Kans., on August 6, 1914, he flew to a new American altitude record, official, of 15,256 feet in his Day-Gyro plane. Thompson followed the Bryant brothers in launching sky-writing. "We were froming letters with our smoke trail * * * either the middle or the latter part of 1914 * * * I wrote 'CAL' at * * * Ascot park * * * in 1914," he testified in the suit of Skywriting Corp. vs. Phill', Pet. Co. In 1916 he covered various cities "bombing" with pyrotechnics at night, to show his trail through the sky in behalf of national defense. At Boston he was called the "Human Comet" who "writes in the sky" in searchlit loops for the benefit of the Mass. Volunteer Air Assn. It was not until May 4, 1916, that he had his first accident as passenger with Lieut. Henry W. Bleakley. In 1917 he made his last exhibition, at Arden Downs, near his home town. Until 1922 he operated a coal mine in western Pennsylvania, then a general construction company, until his health was seriously impaired in an automobile accident in 1945. His last flight, in 1937, was to demostrate the DeLloyd airplane, a 2-place high wing monoplane which he had designed and built with the idea of entering manufacturing. This was not, however, marketed. One son, Robert, a veteran of World War II, survives, with two nephews, DeLloyd Samuel Thompson and John Thompson, in the Navy. His only brother, Clyde, died several years ago. The staff of the Washington, Pa., Reporter, citizens, service clubs and veterans organizations in Wasshington, Pa., are establishing a fund for the erection of a memorial to the famous aviator. Friends of Dutch Thompson are urged to contact Robert H. Campbell, General Chairman, Thompson Memorial Fund, c/o Observer Puclishing co., Washington, Pa.